Have you been skipping your eye exams because you’re tired of the bulky equipment and painful procedures? Don’t put your eyes at risk any longer. Dr. Barry Leonard and his staff now perform innovative no-puff eye exams using the iCare Tonometer, a revolutionary new piece of ophthalmological equipment. This new tool allows us to test for common risk factors without numbing drops or painful puffs of air. Read on to discover more about this exciting new equipment, and how you can keep your eyes healthy for years to come. Glaucoma is a chronic eye disease that affects more than three million American adults. It is also the most common cause of blindness in the United States. Unfortunately, since glaucoma does not present early symptoms, many people are at risk for this debilitating condition without knowing it. One of the best ways to predict a person’s risk of developing glaucoma is to examine their intraocular pressure, or the pressure that builds up inside your eye. An intraocular pressure falls outside the normal range often indicates glaucoma. Traditionally, Optometrists measure their patients’ intraocular pressure using a tool that projected a harsh puff of air onto the surface of the eye. This numbing eye drops, intense pressure, and excruciating wait make it one of the most unpleasant parts of a normal optometry exam! No-puff eye exams are an innovative solution to this problem. What Are No-Puff Eye Exams? Now, you can experience the peace of mind that comes from a thorough glaucoma testing without any of the hassle. Dr. Barry Leonard and his staff now utilize the iCare Tonometer, which measures intraocular pressure with no eye drops, no puff of air, and no pain. It consists of a quick, gentle tap against the surface of the eye. Many patients do not feel the slight pressure of the device at all. Plus, you won’t need to deal with the inconvenience of numb eyes. These revolutionary no-puff eye exams are particularly helpful for young children and anyone who has avoided the eye doctor because of painful or stressful procedures. When Should I Have An Exam? Most people should have no-puff eye exams every one to three years, depending on your family history and risk of developing glaucoma. If you are over the age of 65, or present any of the most serious glaucoma risk factors, you should have your intraocular pressure measured every six to 12 months. Don’t avoid the doctor’s office because you think that your sight is normal or haven’t noticed any changes. Loss of peripheral vision occurs very gradually, and most people do not notice until it is too late. Regular appointments with an Optometrist can alert you to the warning signs and give you practical ways to protect your eyes from damage and degeneration. Your sight is too important to risk! Glaucoma should not be taken lightly. It is a debilitating disease that can destroy your sight and seriously impact your quality of life. 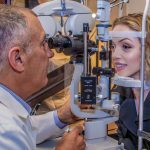 If you want to keep your eyes healthy and clear so that you can experience all of life’s most precious moments, it is absolutely crucial that you regularly visit a registered Optometrist. Make an appointment today or contact Dr. Barry Leonard’s office at 818-891-6711 to learn more about our no-puff eye exams!